Welcome to Casitas Santiago Hills! 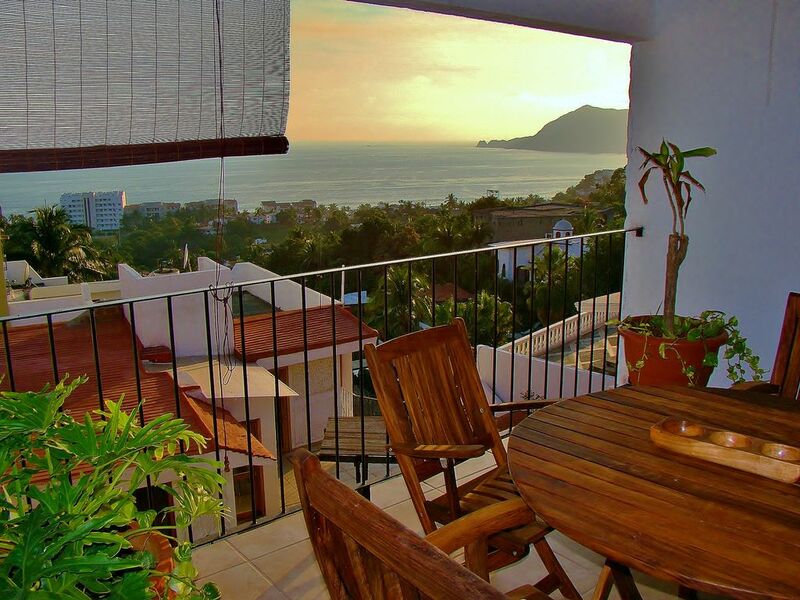 People say that a picture is worth a thousand words, but no picture can describe the breathtaking views this private beautiful 1 bedroom apartment has to offer, from the beautiful city lights of Manzanillo during the night, to the amazing multicolored hues of the sunset reflecting over the sea. This spacious apartment is perfectly designed to use all the natural energy the world has to offer so your stay is always full of natural light and is naturally cool. During the day the sea breeze blows directly into the loft offering a much cooler stay than any other place below the hill at sea level. During the night the wind blows from inland over the mountains coming directly into the loft. Specially designed windows allow for the cool wind to recycle constantly inside the house creating a fresh atmosphere, and if you feel you need a little more cooling the multiple ceiling mounted fans, will take care of that for you; as well as the waterfall like fountain located inside the living room. Forget the traffic, noise and neighbors, enjoy life above it all, Santiago Hills is perfectly secluded and just above the life of this amazing town. Enjoy the beautiful pool & stunning palapa that offers views of the ocean and city. You may reach us in the USA with the phone numbers given. *Home made breakfast, lunch, and dinner available at additional cost which varies according to dish selection and season. *Maid Service offered 3 times a week. Washer and Dryer in the unit. Keywords: Private loft - Open Floor Plan. Manzanillo Lovers. We have been to every beach in Mexico, and Manzanillo wins because of its pueblo feel, affordability, privacy, and its not a big PARTY TOWN, making it very nice and quiet, exactly what we want when we retire. We actually built the whole complex from scratch, it was an empty piece of land and now its a 4 house complex. Its all brand new construction in 2008 & 2009. The benefits we see its that its a very small town, with no major international tourism keeping things pretty quiet and relaxed. Being only a couple of hours away from Los Angeles direct flight from LAX to ZLO and also the house is located just 20 min away from the airport, pretty much at the very beginning of the town. The house is located on a hill very secluded from the noise and traffic and everyone else, so its quite private. Our families have been coming to this town to vacation since the 60's so we decided to make it our second home. Perfect weather, amazing views, its cooler than most properties at sea level since we are on a hill. We can just walk down the hill to the beach with our dogs; also to the convenience market just below the hill we could buy basic necessities as well as beer/ wine. We recommend that you either rent a car from us for only $35/ day + Fuel or one at the airport for $60USD/ day + miles + Fuel. We do offer FREE AIRPORT PICKUP! Mountains are behind the loft they do not block the view of the Ocean. All linens provided. Towels and pool towels. No beach towels included and towels may not be removed from property. Washer is in the unit. Detergent not included. Dryer is in the unit. Frabric Softner not included. One Covered Car Parking Garage with Gate. Toaster, Blender and additional small blender. Coffee Maker. Garbage Disposal unit in the sink. SKY television with English and Spanish channels. Several CD's for listening - please use the DVD player and TV Speakers for audio. Several DVD's, VHS tapes for your viewing pleasure. Accessible to access, however the bathroom is not equipped with handlebars. For an additional fee you can request to lock the pool just for your use if there are other tenants in other units. Owner shares pool but leaves it private 99% of time unless there is another tenant sharing. Please see my review for this same location from February, 2018. All those comments continue to apply and Linda is still the perfect hostess. We are already booked to spend four months here next winter. We now consider ourselves "veterans" of Manzanillo (I know, a stretch after only two years) and I think we have a pretty good "feel" for what is available in the City and surrounding area and, in our view, this is absolutely the best location and the best value on the market. If you are planning a visit to this delightful area of Mexico, this is the place to stay. The "Loft" was everything we'd hoped for. The accommodation was wonderful with a beautiful pool, beautiful views, and beautiful weather. We did find climbing the hill a bit daunting but taxis are plentiful and cheap. Linda was very helpful and introduced us to Jorge, a local English-speaking cabbie, who took us on a day trip to various towns and tourist attractions. A couple of small items would make the Loft even more perfect: binoculars to enjoy the view, more kitchen cooking utensils (pots & pans), and a VCR for the VHS collection. All in all a fine vacation! Too bad that you did not ask for what you are mentioning in your review before. We do have binoculars, my mom has extra kitchen utensils for all the units we rent and believe it or not we do have a VCR! We only left the DVD player for the DVD Collection also on the loft since now in days people don't want to watch VHS movies, specially since a lot of our renters now watch Netflix. But as we always ask our renters, if you ask Linda, she will make sure you get anything you need :) We will make sure you have it in your next trip. Happy 2019 and look forward to having you guys back soon! We loved our stay in manzanillo! Linda was amazing and the place was stunning! We can’t wait to come back! Thanks Melinda! We are so happy you enjoyed your stay and look forward to having you back soon! We just returned from a 3 month stay at Casitas de Santiago. We loved every minute of it, so much so that we have already booked for the same period next year. The most important benefit of this location is the presence of the live-on-site owner/manager Hermelinda; her kindness, generosity and resourcefulness never ceased to amaze us. While never intrusive, she was always right there to quickly and efficiently deal with any (few) issues, maintenance or otherwise, that might arise. Thank you linda, for all you did for us! The loft unit is every bit as beautiful as depicted in the pictures. Bright, airy, constant cooling breezes, spectacular views of Santiago Bay. Unit is very well equipped and maintained; most comfortable bed we have ever slept in! The palapa and pool are delightful and with only two other rental units in the complex we really had the common areas completely to ourselves 90% of the time as other guests would be off most of the day golfing or just exploring beaches etc. We loved Manzanillo! Beaches to walk for miles, many great places to eat and drink (most at very modest prices) modern fully stocked super markets and other shopping and, of course, the large, funky and eclectic Santiago market on Saturdays...if they don't have it, you don't need it! We used buses and taxis for all our transportation needs, cheap and easy! But most attractive to us was the people of Manzanillo...almost without exception they were warm, friendly, and eager to be helpful. It helps to have at least a few basic Spanish phrases...you don't have to be fluent at all, just try! Oh, and the weather...we were there 95 days, cloudless blue skies for 92 days, some overcast for 3 days with one hour of showers. Temperatures warm (ie hot in the sun) days and delightfully cool evenings for sleeping. Now you know why we are going back! Thank you for your review. Linda is already missing you guys and cant wait to have you back this coming season. We are happy to hear you liked the place an had a great time :) Having people like yourselves in our place is a delight. We cant wait to have you back! Very beautiful place and amazing views while relaxing. Nice location to places and kept up very well. The hospality was more than I can ask for. We are very happy to hear you enjoyed your stay at Casitas Santiago Hills. We look forward to having you back in the near future! Nearest attraction is the Ola brisa botanical garden featuring palms and plants from all over the world and Mexico.